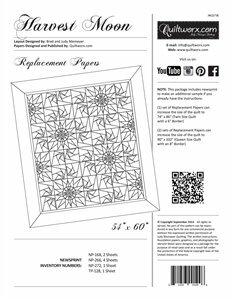 African Violets Replacement Papers from Judy Niemeyer. 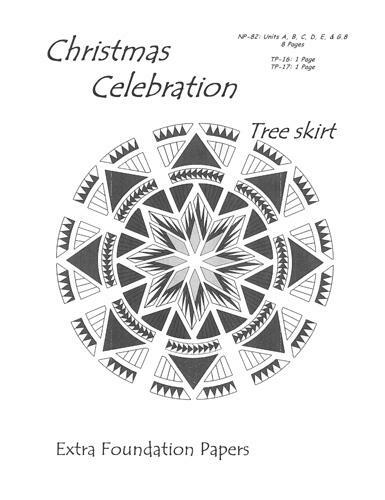 Measures 18" diameter. 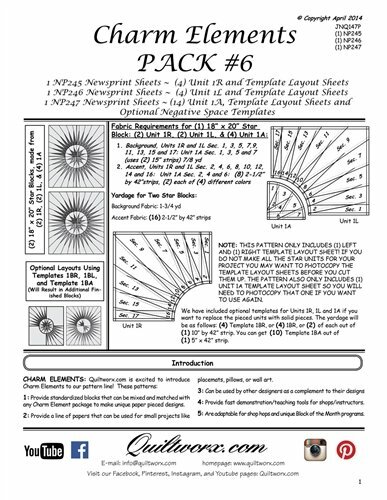 Includes paper for 4 placemats. 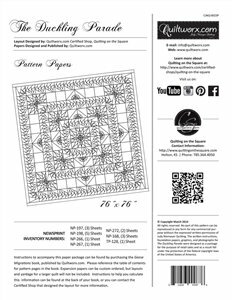 Always Chasing Rainbows by Quiltworx measures 17" x 60". 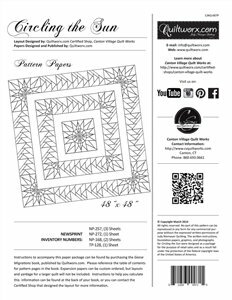 Instructions to accompany this paper package can be found by purchasing the Geese Migrations book. 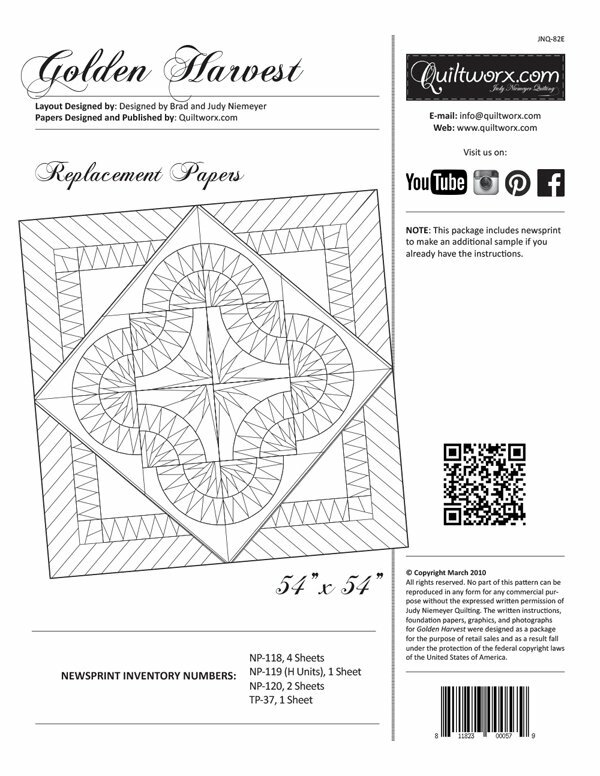 Baby Bella Replacement Papers from Judy Niemeyer measures 36" x 36". 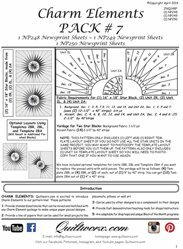 Breaking Dawn by Judy Niemeyer measures 56" x 66". 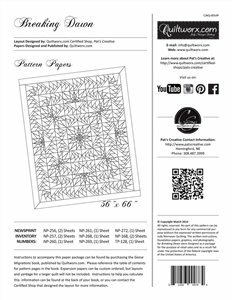 Instructions to accompany this paper package can be found by purchasing the Geese Migrations book. 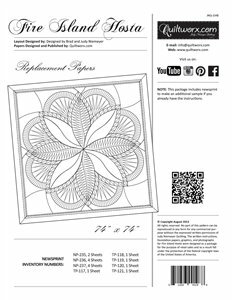 Cabin Comforts by Judy Niemeyer measures 72" x 72". 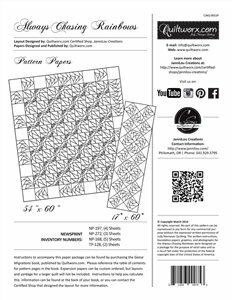 Instructions to accompany this paper package can be found by purchasing the Geese Migrations book. Canadiana by Judy Niemeyer measures 61' X 63". 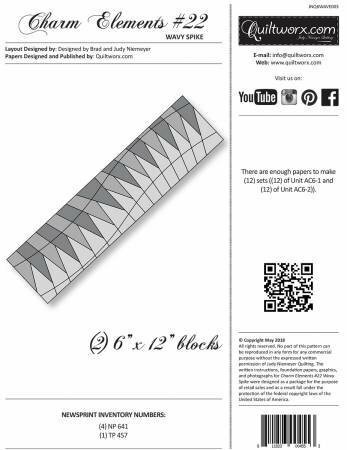 Instructions to accompany this paper package can be found by purchasing the Geese Migrations book. 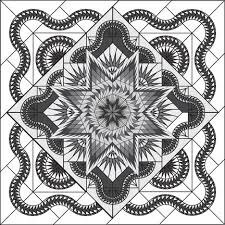 Celestial Flight by Judy Niemeyer measures 60" x 60". 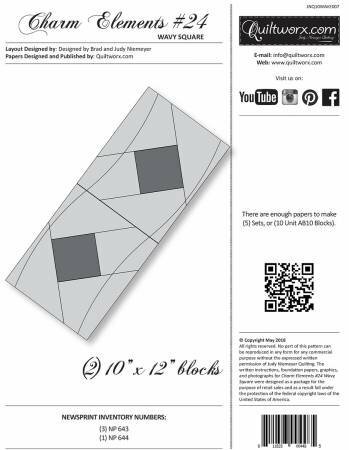 Instructions to accompany this paper package can be found by purchasing the Geese Migrations book. 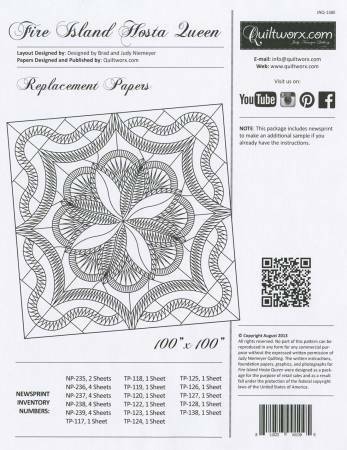 Charm Elements #18 Circling Goose Left contains enough papers to make (30) 6" blocks. 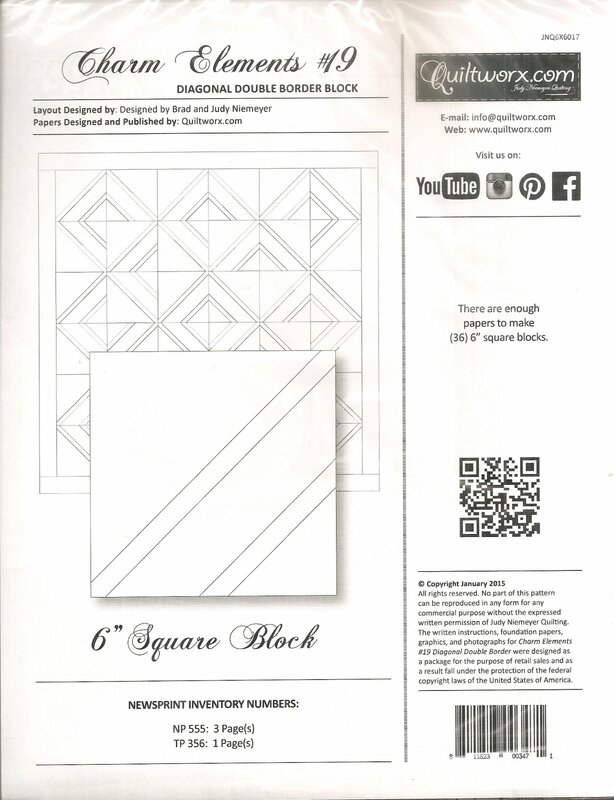 Charm Elements #19 Diagonal Double Border Block from Judy Niemeyer contains enough papers to make (36) 6" square blocks. 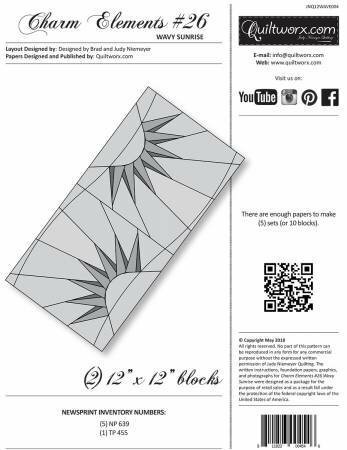 Charm Elements #21 Wavy Goose from Judy Niemeyer. Charm Elements #22 Wavy Spike from Judy Niemeyer. 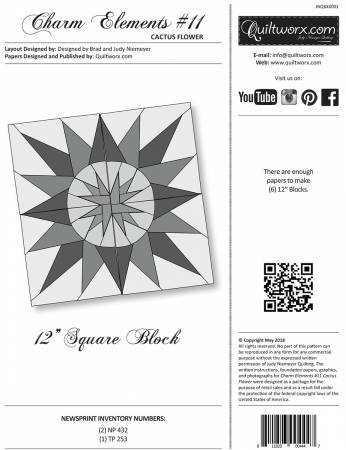 Charm Elements 10 Large Star from Judy Niemeyer contains enough papers to make (10) 12" square blocks. 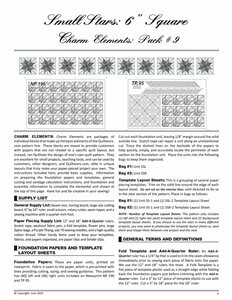 Charm Elements 11 Cactus Flower from Judy Niemeyer. 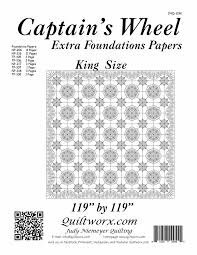 There are enough papers to make (6) 12" square blocks. 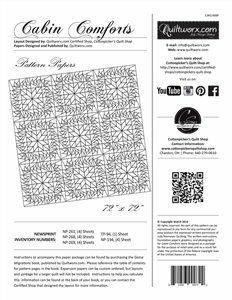 Charm Elements 12 Cactus Flower Blossom from Judy Niemeyer. 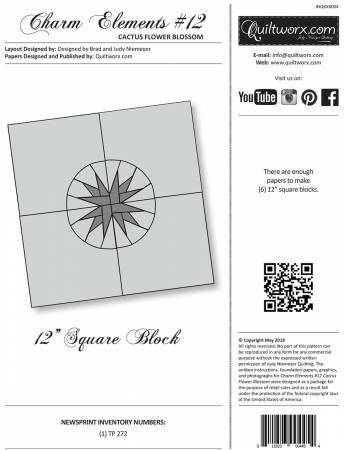 There are enough papers to make (6) 12" blocks. 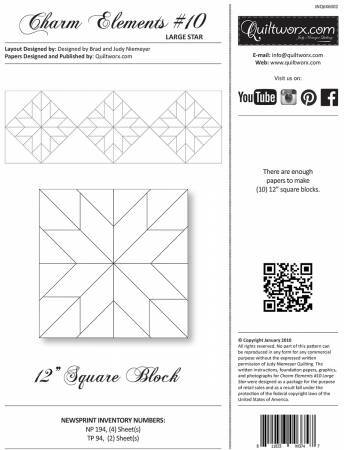 Charm Elements Pack #1 is from Judy Niemeyer Quilting for foundation paper piecing. 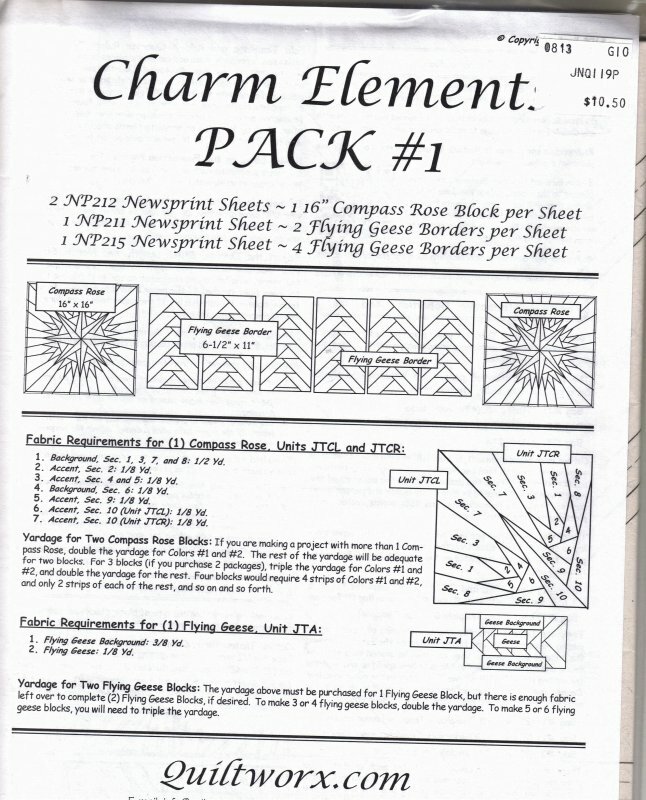 Charm Elements Pack #14 from Judy Niemeyer. 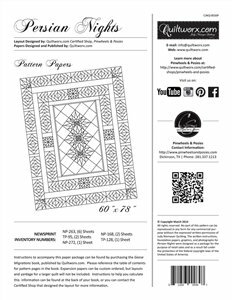 Charm Elements Pack #2 is a pattern from Judy Niemeyer. Circling the Sun by Judy Niemeyer measures 48" x 48". 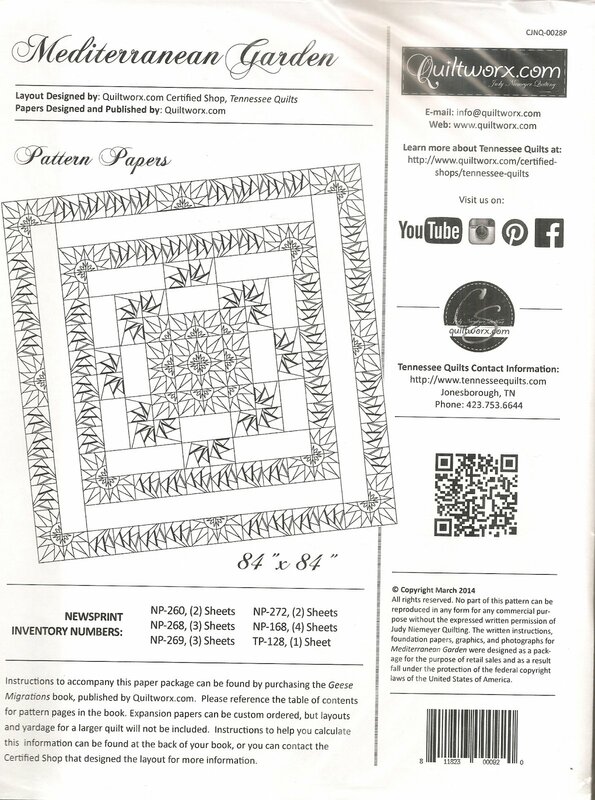 Instructions to accompany this paper package can be found by purchasing the Geese Migrations book. 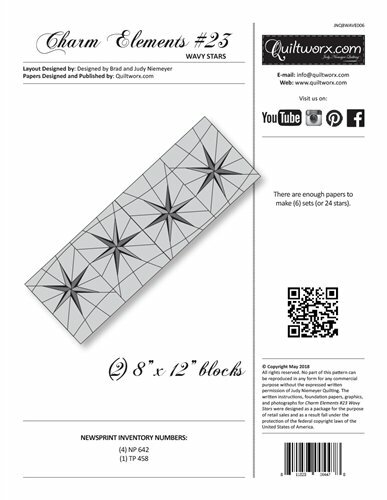 Constellations by Judy Niemeyer measures 60" x 60". 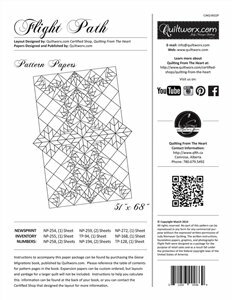 Instructions to accompany this paper package can be found by purchasing the Geese Migrations book. 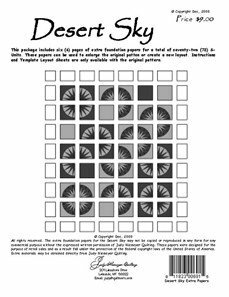 Desert Sky Extra Foundation Papers measure 48" x 54". 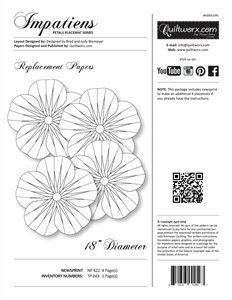 Dogwood Replacement Papers from Judy Niemeyer. 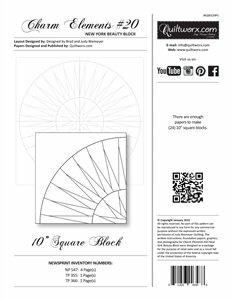 Measures 18" diameter. 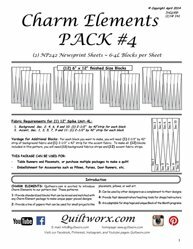 Includes papers for 4. The Duckling Parade by Judy Niemeyer measures 76" x 76". 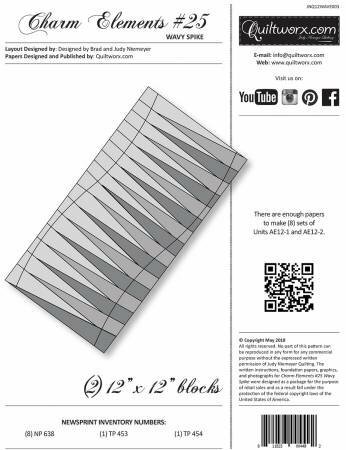 Instructions to accompany this paper package can be found by purchasing the Geese Migrations book. 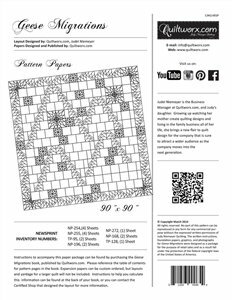 Fairytale Courtyard by Judy Niemeyer is the pattern papers for the quilt measuring 60" x 60". 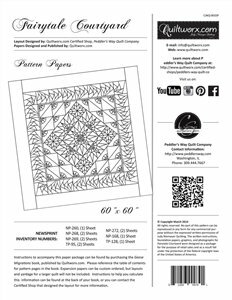 Instructions to accompany this paper package can be found by purchasing the Geese Migrations book. 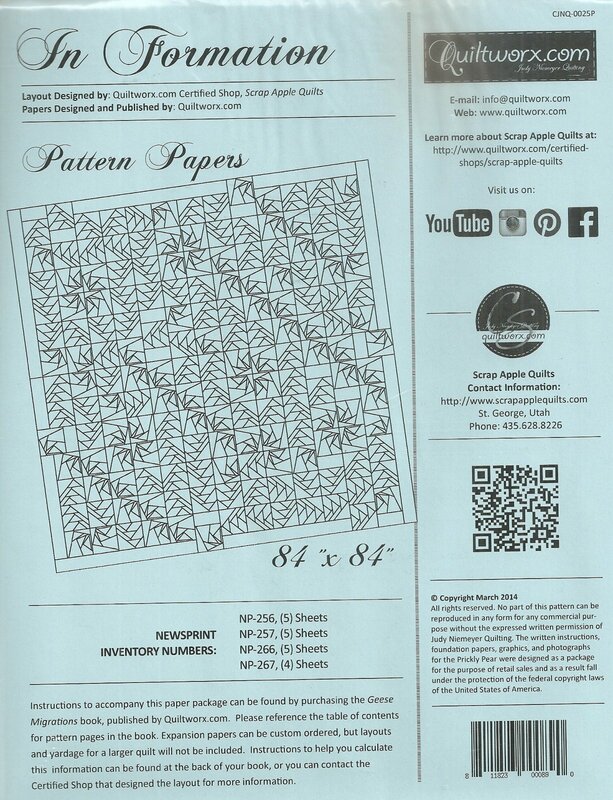 Fire Island Hosta Queen Replacement Papers by Judy Niemeyer Quilting measures 100" x 100". 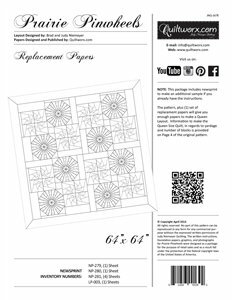 Fire Island Hosta Replacement Papers from Judy Niemeyer measures 74" x 74". 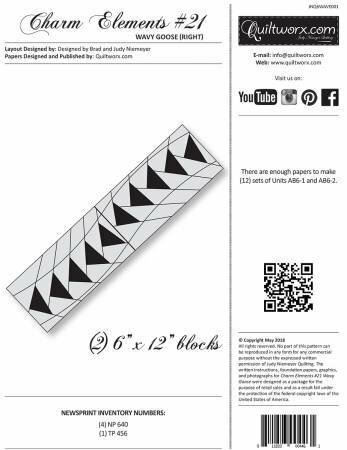 Fish Ladders by Judy Niemeyer measures 57" x 59. 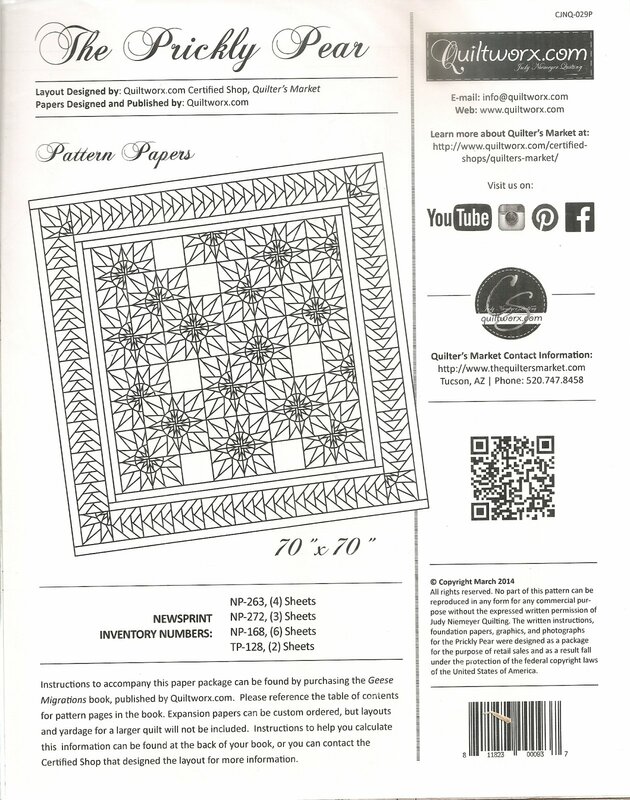 Instructions to accompany this paper package can be found by purchasing the Geese Migrations book. Flight Path by Judy Niemeyer measures 51" x 68". 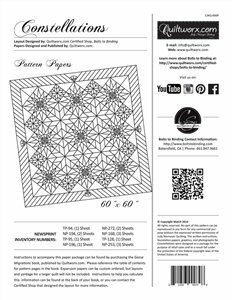 Instructions to accompany this paper package can be found by purchasing the Geese Migrations book. Geese Migrations by Judy Niemeyer measures 90" x 90". 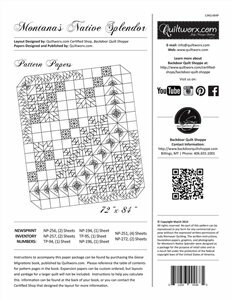 Instructions to accompany this paper package can be found by purchasing the Geese Migrations book. 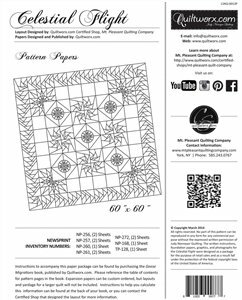 Geese Over the Flathead measures 42" x 72". 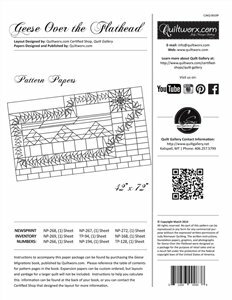 Instructions to accompany this paper package can be found by purchasing the Geese Migrations book. 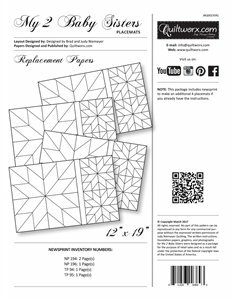 Golden Harvest Replacement Papers from Judy Niemeyer. Measures 54" x 54". 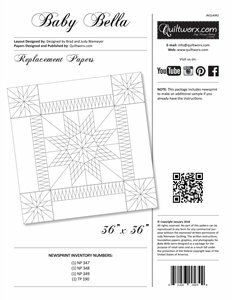 Harvest Moon Replacement Papers for quilt measuring 54" x 60". Impatiens Replacemenet Papers from Judy Niemeyer. 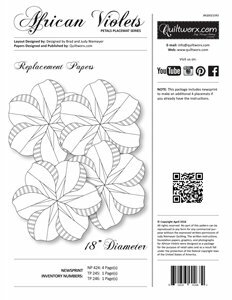 Measures 18" diameter. 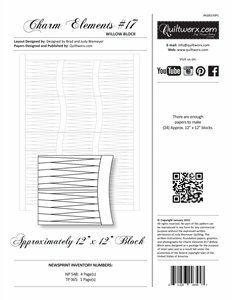 Includes papers for 4 placemats. In Formation by Judy Niemeyer measures 84" x 84". 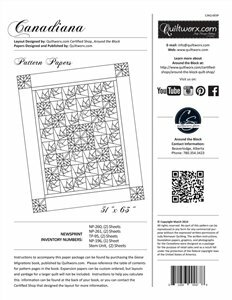 Instructions to accompany this paper package can be found by purchasing the Geese Migrations book. Mediterranean Garden measures 84" x 84". 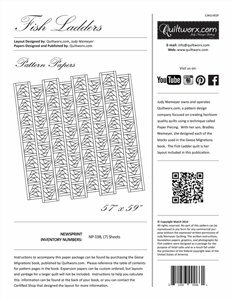 Instructions to accompany this paper package can be found by purchasing the Geese Migrations book. Montana's Native Splendor by Judy Niemeyer measures 72" x 84". Instructions to accompany this paper package can be found by purchasing the Geese Migrations book. 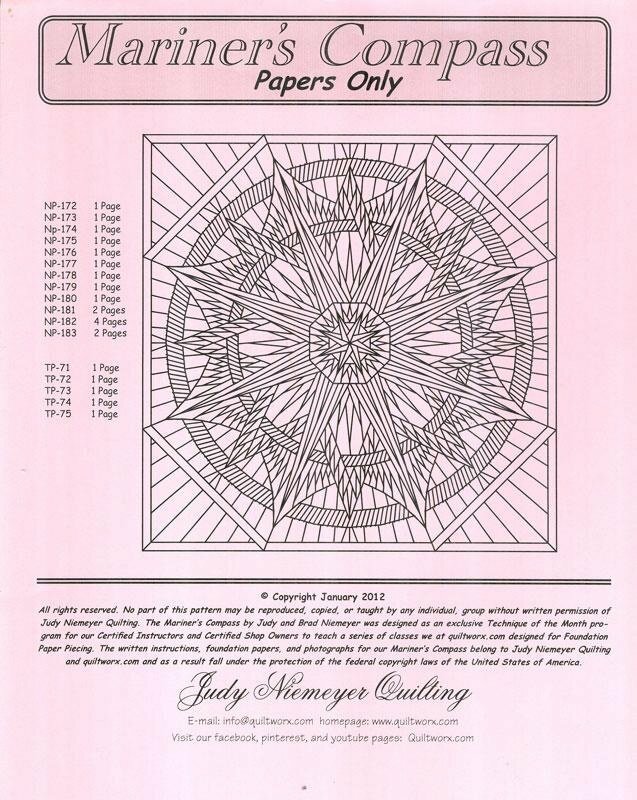 My 2 Baby Sisters Replacement Papers from Judy Niemeyer. 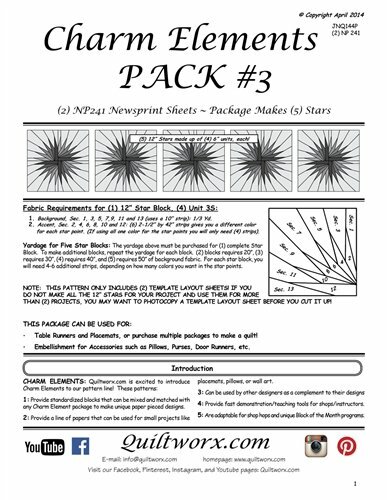 This package includes newsprint to make an additional 4 placemats if you already have the instructions. Persian Nights by Judy Niemeyer measures 60" x 78". 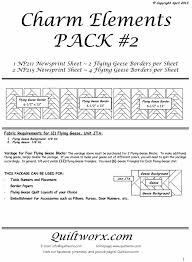 Instructions to accompany this paper package can be found by purchasing the Geese Migrations book. 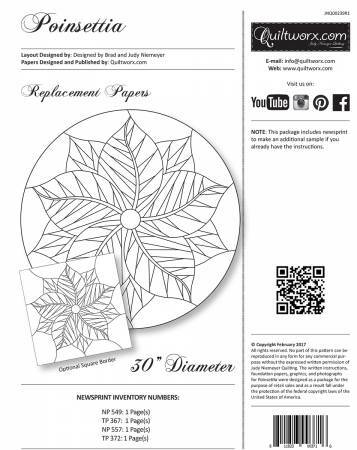 Poinsettia Replacement Papers from Judy Niemeyer measure 30" diameter. 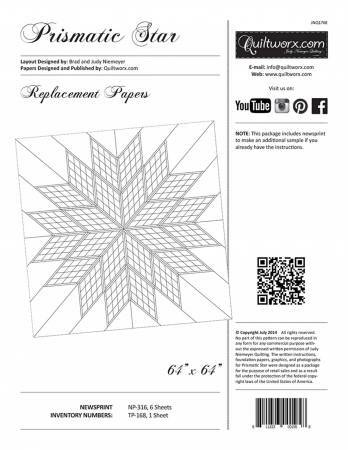 Prismatic Star Extra Paper from Judy Niemeyer. 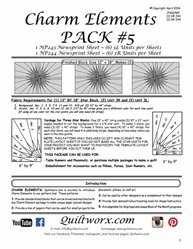 64" x 64".